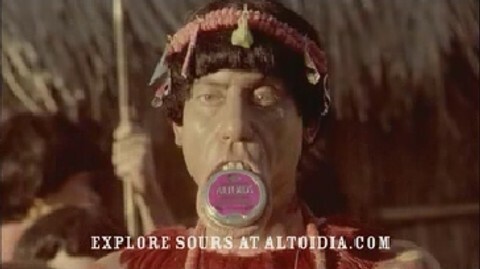 Another Gold winner at the 2005 Cannes Lions is Leo Burnett‘s Altoids campaign of new myths: “People of Pain”, “Mastering the Mother Tongue”, “Fable of the Fruit Bat”, featuring a mythical anthropologist Sir Gerald Pines investigating the impact of strong mints. Land of the Fruit Bat features our arrogant anthropologist scoffing the fear of the giant fruit bat. In the middle of his debunkal Pines is picked up by a giant bat and thrown against his truck. 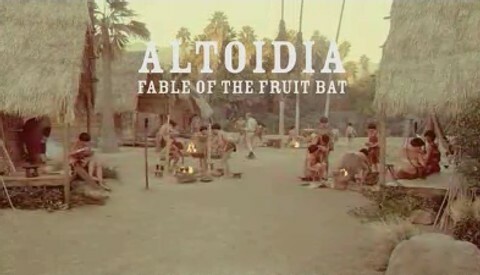 Altoidia – Land of the Fruit Bat. Natives on Altoidia live in fear of chew-chew – fabled fruit bat, a winged giant driven mad by the slightest hint of sourness. Of course, it’s madness, a bogeyman sham cooked up by a… ah!… bad doggie bad doggie! Righto I’m alright. Nothing to see here. Theresa Hogue, a columnist with Corvallis Gazette Times, points out the inherent racism being demonstrated in the the Altoidia series. The Altoidia campaign was developed at Leo Burnett Chicago by creative directors G. Andrew Meyer and Noel Haan, and agency producers David Moore and Vince Geraghty. Director Craig Gillespie worked via production company: MJZ Los Angeles, with producer Deb Tietjen. Editor was Paul Martinez at Lost Planet.